I would like to welcome you to our second Around the World Conference. This year’s conference is on Privacy and Surveillance in the Digital Age. The ATW conference was the idea of the Founding Director of KIAS, Jerry Varsava. The idea is to support a truly international discussion around a topic that concerns us all around the world. This year we have speakers from 11 countries including Nigeria, Netherlands, Japan, Australia, Italy, Israel, Ireland, Germany, Brazil, the US, and of course Canada. This ATW conference is an experiment. It is an experiment because it is difficult to coordinate the technology across so many countries and institutions. It is an experiment in finding ways to move ideas without moving bodies. It is an experiment in global discussion. Last week I was at a great little conference, the International Ethics Roundtable 2014. My conference notes are at Information Ethics And Global Citizenship. I gave a paper titled, “Watching Olympia”, about the CSEC slides that showed the Olympia system developed by the Communications Security Establishment Canada. You can see the blog entry that my paper came from here. Stéfan Sinclair invited me to a half-day conference and lunchy that closed his LLCU-602: Digital Humanities – New Approaches to Scholarship course. You can see my conference notes at Grad Student Mini-Conference On The Digital Humanities. At lunch while the others were eating I was asked to talk about careers in the digital humanities. My talk was on “Thinking Through” as a practice in the humanities that is open to the digital. I started by talking about the recent Von Trotta film about Hannah Arendt which presents Arendt as an uncompromising advocate for thinking for oneself. 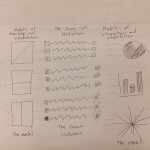 I tried to spin out how one might think for oneself through the epochal interactive matter we have before us. What I didn’t have time to argue was how thinking through is for me an alternative way of characterizing what we do in the digital humanities. It is an alternative, on the one hand, to Willard McCarty’s argument for modeling (as the model, so to speak), and Matt Kirchenbaum’s argument that for the digital humanities “as/is” tactical. My argument suffers from some of the same problems that Fish finds in Ramsay’s work (in whose company I quite happy to be); namely that I find the digital humanities both to be an extension of existing humanistic ways of thinking and also a new way. 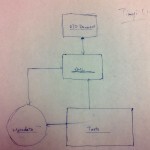 I tried to show how it is simultaneously an old way of thinking and a new one. What has changed is the matter(s) we think through and the dangers we ford. The new matters are the digital evidence and computing affordances. The new dangers are the discourses of efficiency and instrumentality. Inside Higher Ed has a good article on the gender imbalance in Philosophy titled, Georgia State tries new approach to attract more female students to philosophy. The article discusses an experiment at Georgia State University to increase the number of women philosophers on the syllabus to at least 20 percent and then see if that makes a difference in how women students see the field. The article also goes beyond just the Georgia experiment to discuss reasons and reactions. I can’t help feeling that there is a connection between the statistics (see previous post) about women leaving the humanities for business and a philosophy curriculum with so few women philosophers. 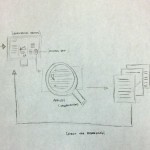 I asked some graduate students to draw diagrams theorizing text analysis. 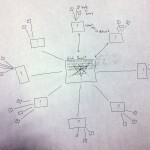 This was partly so that we could test ideas about how things (like diagrams) communicate. 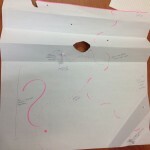 Here you can see the diagrams that Carmen, Jared, Samia, Sandra, and Tianyi developed. I must admit I would never have thought of some of the visual ideas they deployed. Patrizia pointed me to a TEDxCMU talk by Luis von Ahn on The Next Chapter in Human Computation. von Ahn is known for Captcha and reCaptcha (which he talks about in the first 8 minutes of the talk.) In this talk he introduces his team’s new crowdsourcing project duolingo which aims to translate the web while teaching people a second language. Instead of paying $500 for RosettaStone software you can learn a language by translating progressively more complex sentences from the web. von Ahn also calls this a “Fair Business Model for Education”. (There is actually a slide with this phrase.) His argument is that since most of the world doesn’t have the money for software, duolingo presents a fair way for them to contribute labour in return for learning a language. I note that the fair business model could apply not just to language education, but other types of education. How could you monetize the teaching of philosophy (or ethics)? What would people do to learn that could also benefit someone else? 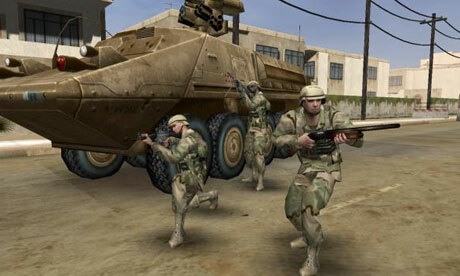 The article also documents games made from an Arab perspective by companies in Syria, developers tied to the Hezbollah and Irani organizations. These games (whether the Kuma\War games or those from other perspectives) can be seen as soft propaganda – making normal attitudes about who is good and bad. Such games don’t train people the way simulators might, but they can recruit people or legitimize a cause. One could argue that just as in the Cold War the “soft power” of American movies played a key role, so in the percieved conflict with terrorism software is playing a similar propaganda role. The problem may be that the wrong people are being portrayed as the bad guys. The propaganda on both sides may be too crude and may make reconciliation harder. In the meantime Iran has sentenced one of the Kuma designers to death accusing him of developing for the CIA. The game gets serious for this poor designer who was detained when he visited family in Iran.